On Friday October 16th 2009 we were at the South Fayette Fire Hall located in Cuddy Pennsylvania. 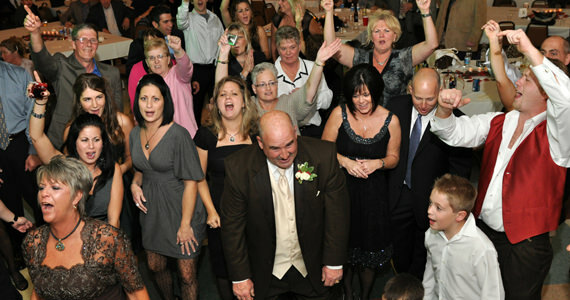 The event was a wedding reception for Jason and Jamie Saunders. 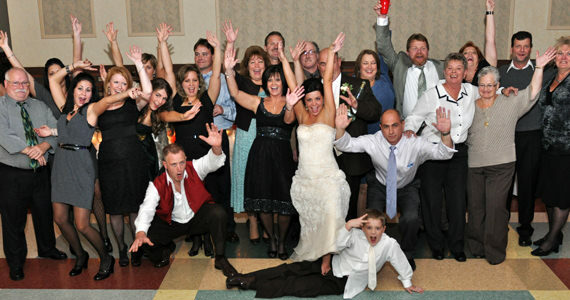 Jason and Jamie were married at 4:00 pm at Old St. Luke’s Church in Carnegie PA. Guests began arriving at the South Fayette Fire Hall around 5:00 pm where they enjoyed cocktails and appetizers. 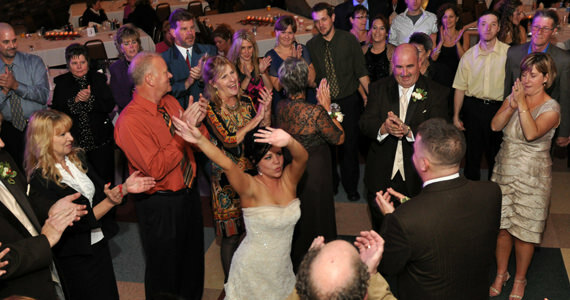 During this time, we informed guests of a surprise that had been arranged by the parents of the bride, Thomas & Gina DiGregory. Tom & Gina had purchased 50 Wish Lanterns that guests would release later in the evening. Wish Lanterns are miniature hot air balloons that originated in Asia. Their release symbolizes the hopes, dreams and wishes for your new life together as a married couple. So during the cocktail hour, we instructed guests to write a wish to Jason & Jamie, on each of the lanterns. Prior to the arrival of the bridal party, we collected all of the Wish Lanterns to maintain the secret. 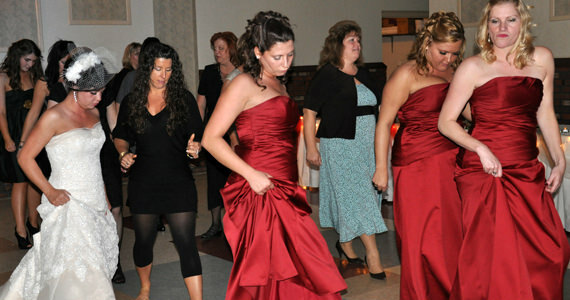 At 6:00 pm we formally introduced the bridal party into the hall to “Sexyback” by Justin Timberlake. 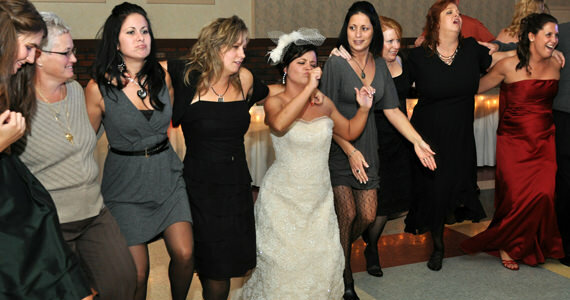 Jason and Jamie were then introduced to the song “Lovely Day” by Bill Withers. Immediately following the introductions, Jason and Jamie cut the wedding cake to “I Wanna Grow Old With You” by Adam Sandler. After the cake cutting, guests were welcomed by the father of the bride Thomas “Spanky” DiGregory. We then handed the microphone over to best man Jaret Hazlett who toasted Jamie and Jason. A second toast followed by matron of honor Angela Ciummo Goodman and maid of honor Renee Abbondanza. Dinner was prepared by Myrna’s Catering of Pittsburgh and was served buffet style. After dinner, we invited the newlyweds to share in their first dance together as husband and wife to the song “The Way I Am” by Ingrid Michaelson. 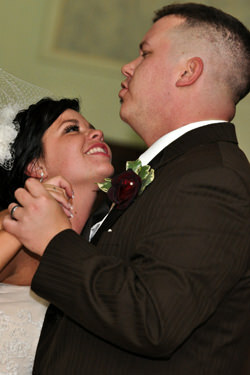 Jamie and Jason then shared in a dance with the bridal party to “I Could Not Ask For More” by Edwin McCain. Next, Jamie danced with her father Tom DiGregory to “My Wish” by Rascal Flats and her mother Gina DiGregory to the song “You Are My Sunshine’ by Bing Crosby. This was the first song that Gina taught Jamie to sing, when she was a little girl. Jason then requested a special dance with his mother Barbara Saunders to the song “The Man You’ve Become” by Molly Pasutti. Following the dances with their parents, Jamie and Jason elected to hold an anniversary dance with all of the married couples in attendance. The song they chose for this dance was “Remember When” by Alan Jackson. The winners of the anniversary dance were Mick & Bev McVeigh, who have been married for 45 years. Congratulations Mick and Bev on 45 years of marriage! After all of the formal dances, it was time to unveil the secret to Jason and Jamie. So we invited the newlyweds to the dance floor and with some help from the bridal party, we showed them the Wish Lanterns. We then asked all of the guests to make their way to the parking lot outside for the release of the lanterns. Once everyone was ready, guests lit their lanterns and the countdown began. Although the weather was not perfect, The Wish Lantern release was truly an incredible sight to see. 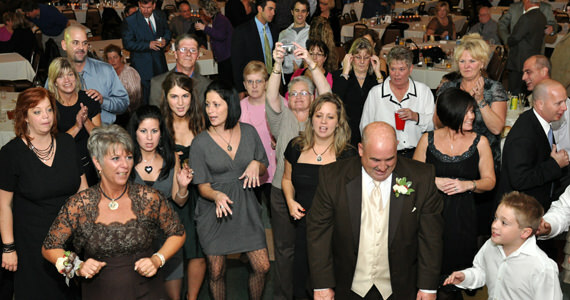 Once everyone was back in the hall, we opened up the dance floor. 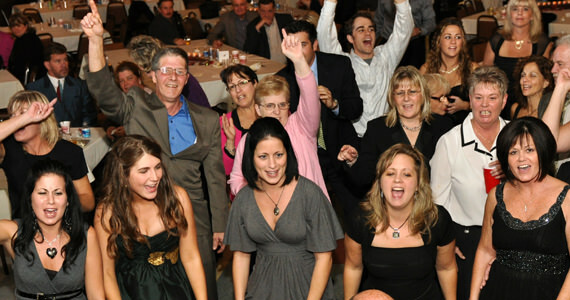 Throughout the remainder of the evening, guests danced to songs by Bryan Adams, Madonna, Usher, Michael Jackson and more. The reception ended at 11:00 pm, with Jason and Jamie sharing in the last dance of the evening to “Always and Forever” by Heatwave.